On Aug. 4, in the middle of Staples at Regency Square, Rodney Burton heard God speak to him. Burton lives in Valrico and attends The Crossing Church. He looked around and thought, there’s got to be a teacher in here, but how do I find one? The woman was Brandon-resident Sharon Leto, a science teacher for Hillsborough High School’s International Baccalaureate program. 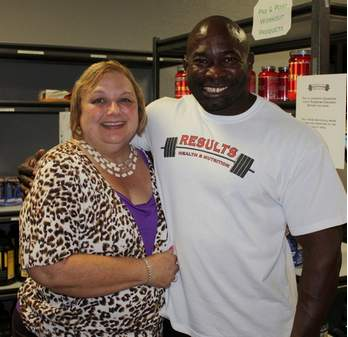 Burton, a personal trainer and award-winning bodybuilder, said it seemed like the right thing to do. Burton’s action amazed Leto, who has taught 26 years in Hillsborough County. She admitted she grumbles from time to time about funding cuts and morale-busting mandates. Science teachers can’t requisition science-experiment items such as liver and flowers or basic supplies like construction paper, tissues, soap, paper towels, scissors, glue and rulers, so Leto, like many teachers, buys them with her own money. People who want to help teachers may visit www.donorschoose.org and www.adoptaclassroom.org, she said. Send stories of community interest to Barbara Routen at Neighbors@tampabay.rr.com. Visit site here.